In the year 386, Augustine of Hippo sat beneath a fig tree, weeping bitterly over the state of his soul. Then he heard the voice of a young child singing, “Take up and read. Take up and read.” Immediately Augustine grabbed the Scriptures and opened to Romans 13: “Put ye on the Lord Jesus Christ.” Augustine went on to become the most influential Church father in Western Christendom. In 1736, on a ship bound for America, John Wesley trembled with fear because of a terrible storm. Despite the wind and waves, on the ship’s deck a group of German Moravians calmly sang hymns. Wesley was stunned at their faith and lack of fear, and after the voyage, learned from a Moravian bishop about “the second birth” and assurance of salvation. In August of 1973, Nixon hatchet man Chuck Colson sat crying in the driveway of a corporate executive who’d just shared with Chuck the good news of Jesus Christ. Chuck gave his live to Christ and became one of the great evangelical voices and Christian worldview thinkers of modern times. We do know the corporate executive’s name. Tom Phillips. Last week, he passed from this life into the arms of his Savior. Tom, that night, told me about encountering Christ in his own life. He didn’t realize it, but I was in the depths of deep despair over Watergate, watching the president I had helped for four years flounder in office. I’d also heard that I might become a target of the investigation as well. In short, my world was collapsing. That night, as Tom was telling me about Jesus, I listened attentively, but didn’t let on my own need. When he offered to pray, I thanked him but said, no, I’d see him sometime after I read C. S. Lewis’s book. But when I got in the car that night, I couldn’t drive it out of the driveway. Ex-Marine captain, White House tough guy, I was crying too hard, calling out to God. I didn’t know what to say; I just knew I needed Jesus, and He came into my life. And the rest, as they say, is history. Chuck went on to found Prison Fellowship, the world’s largest prison ministry. Through his work in the prisons, untold thousands of prisoners and their families across the world came to Christ. 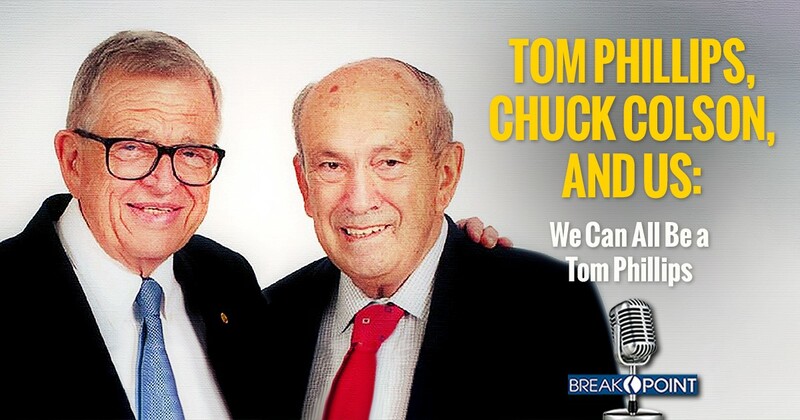 They owe their salvation in part to Tom Phillips’s willingness to share the Gospel with Chuck. All the great work Chuck did for justice reform, and of course the ministry of BreakPoint and the Colson Center, not to mention Chuck’s extraordinarily influential books on Christian worldview, can be traced back to Tom Phillips. Very few of us will ever have the sort of towering life and influence of a man like Chuck Colson. But every one of us can be a Tom Phillips. Just think about it: that kind word in Christ’s name, that work of art that points to truth and beauty, that article or commentary, and especially that face-to-face talk about Jesus… can change a life. And that life might change the world. Praise God for Tom Phillips. Emily Colson, Chuck Colson’s daughter, has shared her reflections about the importance of Tom Phillips, for her father and for her, in an article that we’ve published at BreakPoint.org.